By Chris Williams: Earlier today, former Olympic Gold medalist heavyweight Audley Harrison (23-4, 17 KOs) called out David Haye (22-1, 21 KOs) for a fight, telling him “I’m sure the British public would love to see you send me into retirement,” referring to Haye’s need for an opponent now that Wladimir Klitschko has tired of negotiating with him and has abandoned his efforts for a June fight. This leaves Haye scrambling for an opponent, and due to his history of having a fragile chin and very little experience at the heavyweight level, he’s going to have to tread lightly when selecting a suitable - read: beatable - opponent for him to fight. Now, he may not want to fight Harrison because some people feel that Harrison is damaged goods because of his four losses in the past four years to fighters like Danny Williams, Dominick Guinn, Michael Sprott and more recently to Martin Rogan, but I think Harrison might actually be a step too far for Haye and could very well knock him out if Haye were to give him a chance. Nine years separates the two fighters and that alone would normally be a big plus for the 28-year-old Haye, but in this case I think Harrison has gotten smarter and would be able to use his age and wisdom to defeat Haye. At 6′5″ 250, the southpaw Harrison would be a tough opponent for Haye right off the bat. This isn’t the smallish 37-year-old Monte Barrett that Haye had troubles with in defeating in November. Harrison when he’s motivated and has his back to the wall brings much more power, reach and a knockout threat than Barrett ever could in a fight and Haye would be hard pressed just to get by Harrison’s long jab. Harrison may have lost his last fight to Rogan, a tough club fighter type opponent, in a 10-round decision loss, but Harrison had him hurt on a number of occasions with thunderous left uppercuts including in the last round. It was only because of Rogan’s iron chin that he was able to take Harrison’s big shots without going down for the count. With Haye, though, I can’t see him taking anywhere close to the kind of huge shots that Harrison was landing on Rogan. Believe me, if Harrison lands those same kinds of shots against Haye, you’ll see Haye hitting the canvas and needing to stay down for a long time just like he did after Barrett dropped him in the 5th. Except in this case, Haye wouldn’t be given a gift by the referee ruling it a slip. Harrison will plant him and keep him planted. 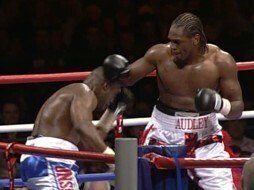 If Haye was to get up, Harrison has always proven to be a good finisher when he’s had a fighter hurt. He’d go after him immediately and take him out with a couple of well aimed left uppercuts to the head. That’s why I doubt that Haye will want to take on an experienced, risky fighter like Harrison. If anything, we’ll see Haye against a Carl Drumond or maybe a Brian Minto type fighter that he doesn’t have to worry about being knocked out by.